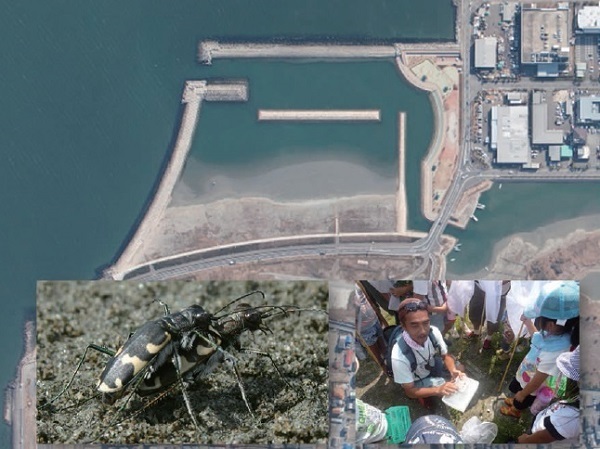 A sandy shore was created for conservation of the endangered tiger beetle Cicindela Lewisi on the urbanized coast of Tokushima Prefecture. For closely mimicking conditions of their original habitats, the direct transplantation of coastal vegetation and surface soil from their native coast was conducted. Soon after the completion of the shore, new recruits of the tiger beetle was found and their numbers have been increasing, suggesting that this mitigation has succeeded on this stage. Moreover, to raise local people’s awareness of the coastal ecosystem, educational programs have been carried out in cooperation with Okinosu Kaihin Tanoshimu Kai, enjoining the Okinosu shore. 2. 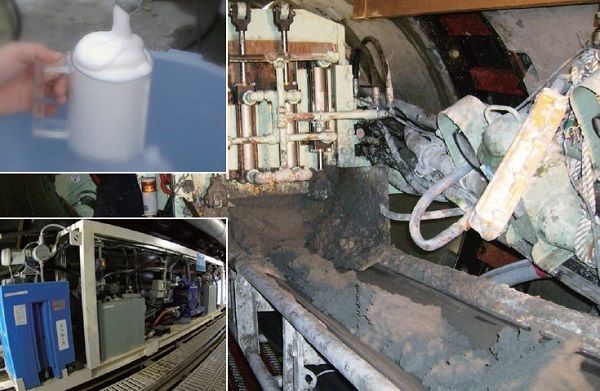 The Development and Commercialization of a New Special Foaming Agent, Eco-Mousse, Achieving Reduction of Environmental Impact to the Level of 1/25 in Shield Tunneling Method. “Eco-Mousse” is a new type of special foaming agent for the Rheological Shield Tunneling Method (RSTM) and is particularly eco-friendly. A conventional type requires a longer time for its biodegrading process and then requires a place to store the soil which contains the agent. “Eco-Mousse” is made through reformation of component chemicals, and has achieved the reduction of environmental burdens to the level of a twenty-fifth of the conventional type. This enables us to allow reduction of place and time for storage, then cost. It is highly evaluated that “Eco-Mousse” will make great improvement in RSTM which is expected to be in more demand in the near future. 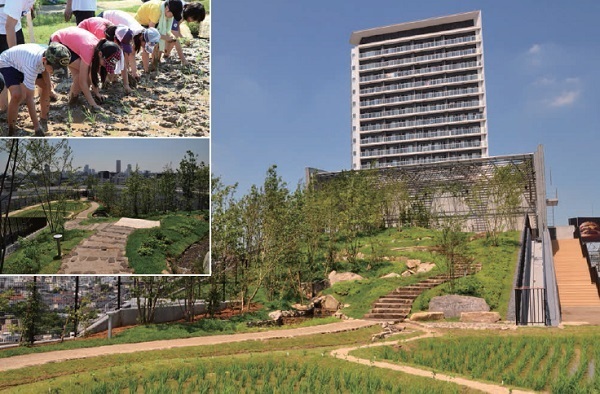 "Ohashi Sato no Mori" is constructed on the rooftop of Ohashi Junction’s ventilation building on the Central Circular Route of Metropolitan Expressway, including hillside forests, grasslands, rice paddy fields to recreate the original landscape around Meguro River. It is expected to be a new center for ecological network after the completion of the green space, and to provide elementary school students with many opportunities to have events to enjoy a countryside environment for around the green space. This is an epoch-making project undertaken in a special environment, and changes the image of public works. Greenspaces attached to urban infrastructures are often maintained and managed by mechanical mowing. In many cases, the frequency of the mowing is insufficient due to cut down of management costs, therefore, leads to an infestation of invasive species and the degradation of biodiversity. 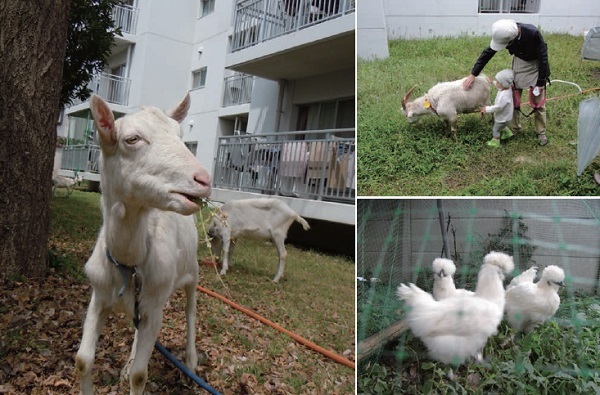 This study examines the management technology and weeding performance by urban grazing goats and chickens which have a lower impact on the environment compared to mechanical mowing. Increases in the abundance of native perennials and the potential for raising public environmental awareness are highly evaluated. ・ABU DHABI OIL CO., LTD.
・Fuyo Ocean Development & Engineering Co., Ltd. In the Arabian Gulf, extreme high water temperatures adversely affect the marine biodiversity. 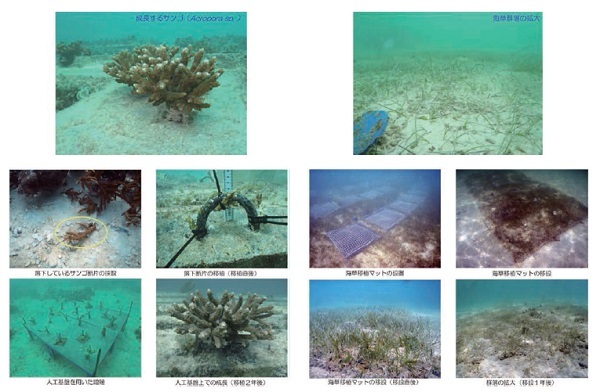 In order to improve environmental potentials, coral and seagrass preservation projects were carried out around an offshore island of the United Arab Emirates (UAE). We have developed a technique to transplant the coral which quantity of existence had largely decreased. The transplant point was decided by the numerical simulation of the movements of coral eggs. These techniques can protect coral from future high water temperatures. In addition, the mattress method of the seagrass was applied to practical use. These actions contribute as a technique to keep a desirable environment based on the civil engineering.